Everyone knew it was crazy to try to extract oil and natural gas buried in shale rock deep below the ground. Everyone, that is, except a few reckless wildcatters - who risked their careers to prove the world wrong. Things looked grim for American energy in 2006. Oil production was in steep decline and natural gas was hard to find. The Iraq War threatened the nation’s already tenuous relations with the Middle East. China was rapidly industrializing and competing for resources. Major oil companies had just about given up on new discoveries on U.S. soil, and a new energy crisis seemed likely. But a handful of men believed everything was about to change. Far from the limelight, Aubrey McClendon, Harold Hamm, Mark Papa, and other wildcatters were determined to tap massive deposits of oil and gas that Exxon, Chevron, and other giants had dismissed as a waste of time. By experimenting with hydraulic fracturing through extremely dense shale—a process now known as fracking—the wildcatters started a revolution. In just a few years, they solved America’s dependence on imported energy, triggered a global environmental controversy—and made and lost astonishing fortunes. No one understands these men—their ambitions, personalities, methods, and foibles—better than the award-winning Wall Street Journal reporter Gregory Zuckerman. His exclusive access enabled him to get close to the frackers and chronicle the untold story of how they transformed the nation and the world. 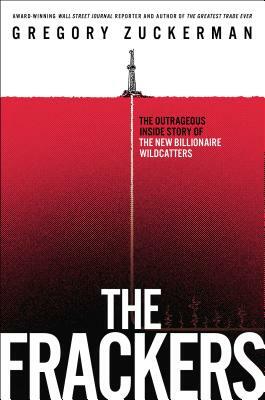 The result is a dramatic narrative tracking a brutal competition among headstrong drillers. It stretches from the barren fields of North Dakota and the rolling hills of northeastern Pennsylvania to cluttered pickup trucks in Texas and tense Wall Street boardrooms. Activists argue that the same methods that are creating so much new energy are also harming our water supply and threatening environmental chaos. The Frackers tells the story of the angry opposition unleashed by this revolution and explores just how dangerous fracking really is. The frackers have already transformed the economic, environmental, and geopolitical course of history. Now, like the Rockefellers and the Gettys before them, they’re using their wealth and power to influence politics, education, entertainment, sports, and many other fields. Their story is one of the most important of our time. GEORGE MITCHELL, the son of a Greek goatherd, who tried to tap rock that experts deemed worthless but faced an unexpected obstacle in his quest to change history. AUBREY McCLENDON, the charismatic scion of an Oklahoma energy family, who scored billions leading a historic land grab. He wasn’t prepared for the shocking fallout of his discoveries. TOM WARD, who overcame a troubled childhood to become one of the nation’s wealthiest men. He could handle natural-gas fields but had more trouble with a Wall Street power broker. HAROLD HAMM, the son of poor sharecroppers, who believed America had more oil than anyone imagined. Hamm was determined to find the crude before others caught on. CHARIF SOUKI, the dashing Lebanese immigrant who saw his career crumble and his fortune disintegrate, leaving one last, unlikely chance for success. MARK PAPA, the Enron castoff who panicked when he realized a resurgence of American natural gas was at hand, one that his company wasn’t prepared for. Gregory Zuckerman is a special writer at The Wall Street Journal and the bestselling author of The Greatest Trade Ever. He is a two-time winner of the Gerald Loeb Award and a winner of the New York Press Club Journalism Award. He lives in New Jersey with his wife and two sons. "Zuckerman’s fast-paced, densely interesting The Frackers is the first book to tell the stories of the obstinate, ravenous, methodical, sometimes rascally oil executives of the recent boom. By focusing on people instead of trends, it gets to the heart of why the United States is once again the largest supplier of oil and gas in the world." "Insightful...At times suspenseful...on-target in telling the tale of a group of wildcatters who risked almost everything and helped launch the United States on the path to energy independence." "A dynamic narrative... introduces us to the major players behind a boom." “If you are looking for the present-day take on a romantic rag-to-riches drama reminiscent of the Gilded Age, engaging tales of brave entrepreneurs whose desire to get really wealthy helped them persevere and prosper come boom or bust, look no further than The Frackers." "Greg Zuckerman's The Frackers will long be considered 'The Bible' on fracking and the history of drilling in the US and the wildcatting billionaires who were the main players. This incredibly thorough book explains, thrills, and has us on the edge of our seats all the way towards US energy independence."